More Kudos for THE SCULPTOR! 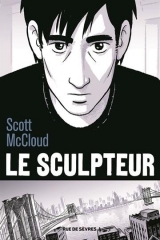 The 82 members of the French Association of Graphic Novel Critics and Journalists (ACBD) have chosen THE SCULPTOR for inclusion in their selection of not-to-be-missed titles from among the books published in France since last November. Previous Post Anne Perry will be in Saint Maur this weekend! Next Post First Second is at the San Diego Comic-Con!